I’m no geometry teacher, but for my money, there could be no better way of teaching real world applications of angles and estimates than by showing students how to blow stuff up with really big guns. I would make the same bold assertion on behalf of physics teachers, as well. Cannon Challenge, brought to you by the good people at the Discovery Channel, puts you in command of the U.S. Army’s shiny, new Non-Line-Of-Sight Cannon. The game includes a link to an article at How Stuff Works on the whys and what-fors of the NLOS Cannon. (See, mom and dad, it really is an educational game!) The weapon, which is scheduled for deployment in 2010, is a real wonder of modern military technology. It has a range of about 18 miles and can deliver all kinds of killer ordinance, from cluster bombs to “fire-and-forget” seeker shells that act like guided missiles. Rocket, Man: As you progress in Cannon Challenge, you have more targets to destroy—including tanks and missile silos—with the same amount of shells. The landscape-based game’s cannon isn’t nearly as sophisticated, but it certainly is addictive. The object is simple: Destroy a series of targets in a range of mountains and canyons by choosing the correct shot angle and shell velocity. Change your elevation and shell velocity by rolling your thumbs over the scroll wheels on each side of the screen. Precision targeting, aided not by unmanned aerial drones but only by your eyes and knack for gauging angles and velocity, becomes crucial as the game progresses. Economy is key. The farther you go, the more targets you need to destroy with the same number of shells. Eventually moving targets, such as helicopters and missile silos, are introduced. These require not only accurate targeting but precise timing, as well. You have 15 opportunities to clear each of 15 levels. Sighting targets becomes more challenging as you move on. Too much velocity, and your shell will go flying off the screen. You can follow the arc of your shot and adjust your next shot accordingly. The plumes of smoke from missed shots make excellent reference marks. Just don’t waste too many rounds—the fewer rounds you fire, the higher your score. 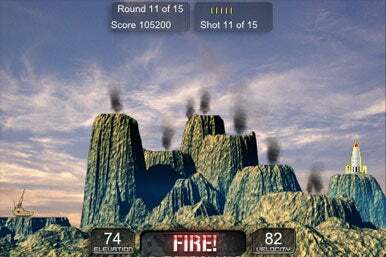 The app for the iPhone and iPod touch is a slightly scaled-down version of a game available at the Discovery Channel’s Web site. Future Weapons, which airs on the Discovery network’s Military Channel, featured the cannon in an episode in the series’ first season. The handheld version of the game is arguably better, with smoother controls and faster transitions between levels. I did notice that the iPhone version is not nearly as forgiving with my shots—the shell needs to be right on target. A shell might just caress a target on the Web version and I could score. But the graphics, which include photographic backgrounds, are as gorgeous and the sound effects are as realistic on the handheld as they are on the game’s Web version. And as a bonus, the handheld vibrates when you score a hit. Cannon Challenge has a couple of flaws and one significant-but-easily-remedied bug. The app would repeatedly crash after I installed it. The game wouldn’t play at all. Only after restarting my device would the game work. I’ve had no problems with it since. You cannot save your games. If you need to leave the app to take a call, for example, all progress will be lost. Even less forgivable, the game does not record your high scores. My triumphant 170,000-point, 15-level game was lost the moment I pressed the Continue button. It would be nice to record high scores and also to be able to compare your scores to other players. I’m sure my high score looks pretty amateurish in the world of Cannon Challenge. But I plan to keep blasting away. Cannon Challenge is compatible with any iPhone or iPod touch running the iPhone 2.x software update.